Wisdom | If You Could Ask God for One Thing, What Would It Be? God appears to Solomon and offers to grant him a request. This isn’t a genie-in-a-bottle situation; it’s the all-powerful God showing his love and appreciation. Solomon makes a wise decision. He asks for wisdom and knowledge to lead the people well. Other people pursue prestige. They seek acclaim from others. Solomon doesn’t ask for honor either. Though receiving respect may be gratifying and ego stroking, it accomplishes little else. Along with money and honor, a third often-valued pursuit is power. An extreme display of power is overcoming our enemies by bringing about their death. Solomon doesn’t ask for this either. Most people hope for a long life, one filled with worthwhile activities and pursuits. And the older we get, the more fragile life seems and the more important it becomes. Yet Solomon doesn’t ask to live long either. What Solomon does ask for is wisdom and knowledge. And this isn’t for a selfish, intellectual pursuit, but so that he can govern the people with excellence. God gives wisdom to Solomon because he asks for it. And he will give it to us when we ask for it too (James 1:5). Whether we lead a country, a group, our family, or ourselves, may we lead well with wisdom and knowledge. 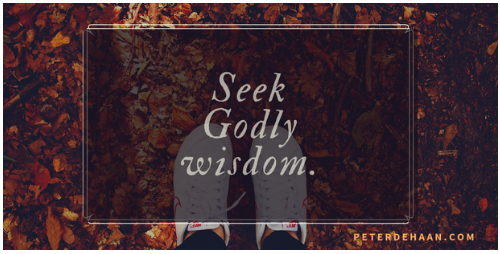 And if we lack wisdom all we need to do is ask God for it.